Remember the financial crisis, the $700B bailout, and Henry Paulson? Guess what? They're all still he-eere. Despite the many smiling faces wherever one goes these days (for example, I went out to dinner last night, said about four syllables to my companion, and the people at the next table were all over us with post-election glee), we continue our ongoing series about the economic debacle. It doth continueth. Latest additions to our updated OrgScope map include the government purchasing up to $250B of preferred stock in certain banks, which puts money in their coffers that they, in turn, are supposed to move back into the lending market. The first eight banks to take advantage of the program, scooping up half the $250B, are: Bank of America, JP Morgan, Citigroup, and Well Fargo, each receiving $25B; Goldman Sachs and Morgan Stanley, each receiving $10B; Bank of New York Mellon ($3B); and State Street ($2B). According to "Devil Is in Bailout's Details," an informative article by Deborah Solomon and David Enrich in the Oct 15, 2008, Wall Street Journal, "the remainder will be available to small and medium-size institutions that apply for an investment:"
The sweeping steps create a thicket of issues, most pressingly whether the banks will step up lending. The government is making clear it expects banks to lend out the funds it gets from Uncle Sam. Further exercising its clout, Treasury also extracted a promise that the financial firms would help struggling homeowners, continue lending and would sign up for loan guarantees offered by the Federal Deposit Insurance Corp.
"What we're doing is making clear to the banks how important it is to deploy the capital," Treasury Secretary Henry Paulson said in an interview. So, compatriots, in the interest of ongoing transparency vis-a-vis the economic mess, we're tracking the contracts as they're let by the Office of Financial Stability. You can track them too by signing up for alerts here. 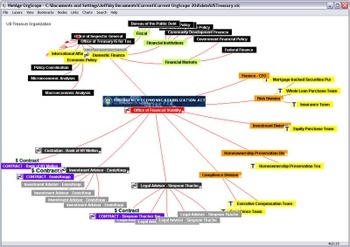 Using OrgScope, we're adding each new award and hire to the map. 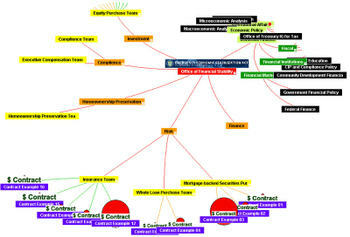 Click this link, wait a few seconds for the dynamic map to load, then click on down through the Office of Domestic Finance (it's over to the right) and then to the Office of Financial Stability and then you'll see the contract awards in purple boxes under the sub-departments awarding them. Roll over the purple box and you can see its value; double click and link right to the actual contract. The map below shows what I'm talking about. Here are the first three contracts as listed on Treasury's site. According to the Treasury Department's October 13 press release, it hired EnnisKnupp as the first investment adviser. Contract total, which you can find here is for $2.495 million. On Oct 14, Treasury announced its award to Bank of New York Mellon for a contract "to serve as its custodian for the implementation of the Troubled Asset Relief Program authorized under the Emergency Economic Stabilization Act...to help the Department with custodial, accounting, auction management and other infrastructure services needed to administer the complex portfolio of troubled assets the Department will purchase." This is a three-year contract and the section containing compensation information is blacked out. On Oct 16, Treasury announced its legal adviser, Simpson, Thacher and Bartlett, its contract here. Total contract award for six months beginning Oct 10, 2008 = $300,000. The numbers are dizzying, the trailing zeros too many to even type...so how are we to understand what the US government is doing to avert economic collapse? One way, we believe, is to shine a little light on who's in charge of the US Treasury Department's Office of Financial Stability, the new agency tasked with managing and distributing the initial $700 billion. Initial, that is, because much has already been spent and because all agree that it will be a heap of a lot more dough before we're done. Transparency is a popular word but, unfortunately, a less popular practice. However, in times like these, being able to truly see what's going on may be the only express route to regaining the trust necessary to rebuild the economy. Thus, we offer our solution to removing the wrappers that typically shroud most financial dealings. 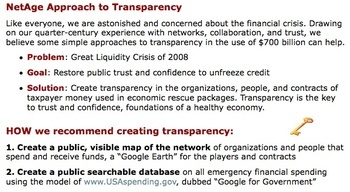 Why is transparency so important? As I've said so often about collaboration here on this blog (and in our books), "purpose is the glue and trust is the grease." Applied to the financial crisis, we write on our NetAge website. Using OrgScope and some good online searching, we've done a rough mapping of the Office of Financial Stability (OFS), the people occupying its various new positions, placing it in the context of the larger federal government, and providing a dynamic map that you can fly around to see who's who and what's what. In the picture below, the red disks illustrate the relative size of the contract values that each of the OFS "policy teams" has to manage. The initial structure that we depict comes from the October 13 press briefing by Neel Kashkari, the new head of OFS. According to the briefing, Pete McCarthy, who also serves as Treasury's Assistant Secretary for Management and Chief Financial Officer, is leading the design team for the new office. As more info becomes available, we'll update the map. Please pass this post along to anyone you know who is interested in rebuilding faith in our economy.